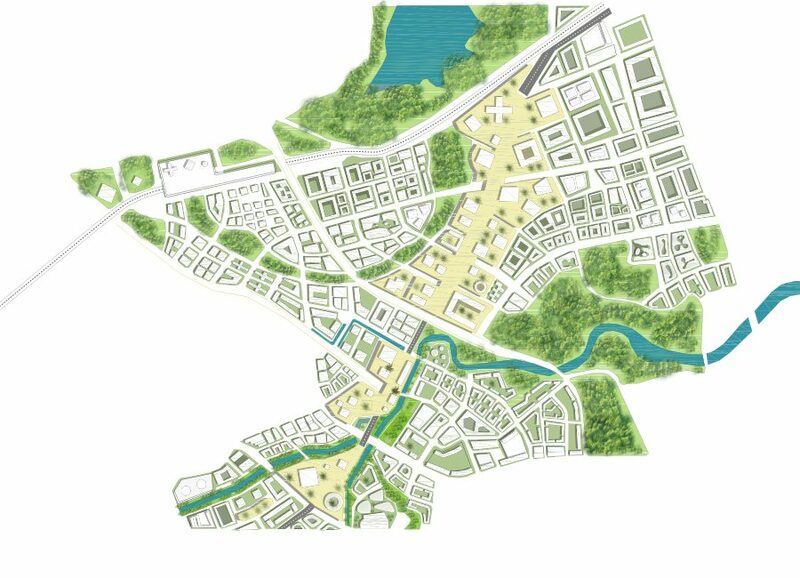 Client: The People’s Government of Pingshan district, Shenzhen municipality. 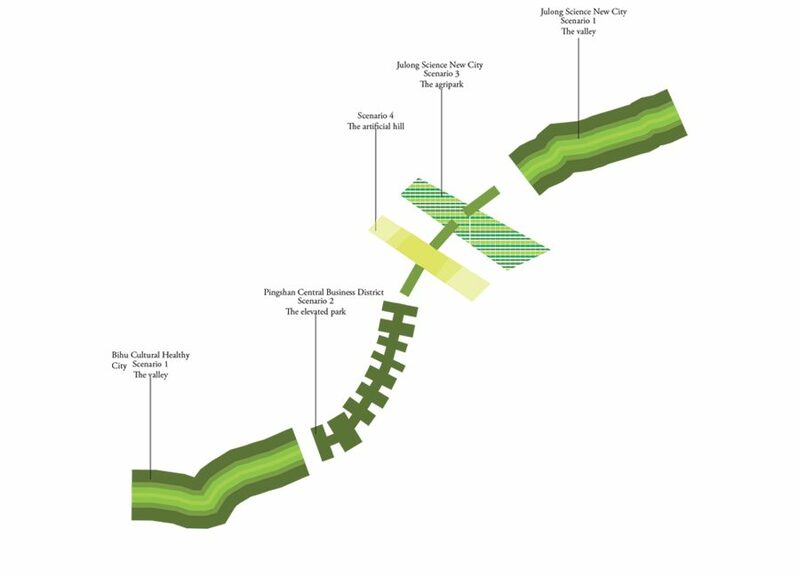 The line stretching from the Longgang district towards east, following the line of Pingshan road, crosses very different districts and natural areas. 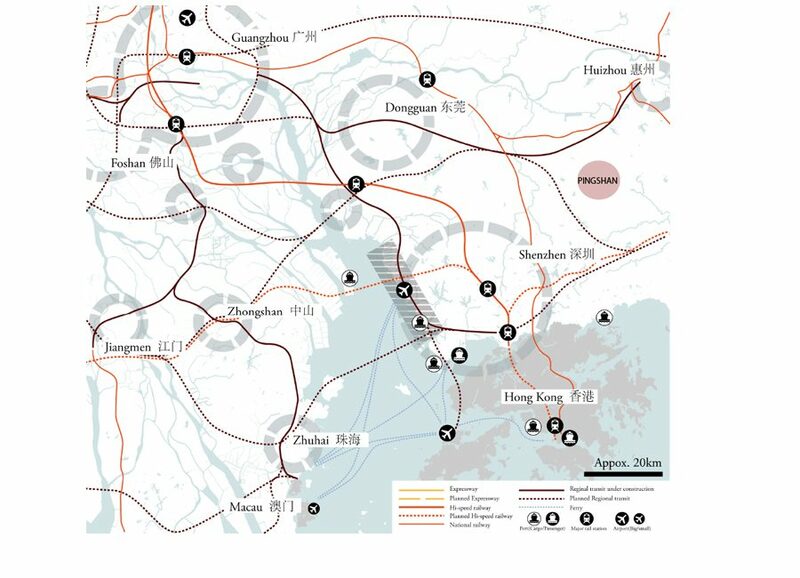 This line represents a huge opportunity for Shenzhen to structure an important development axis towards the east, in long connection with the cities of Huizhou and Xiamen. 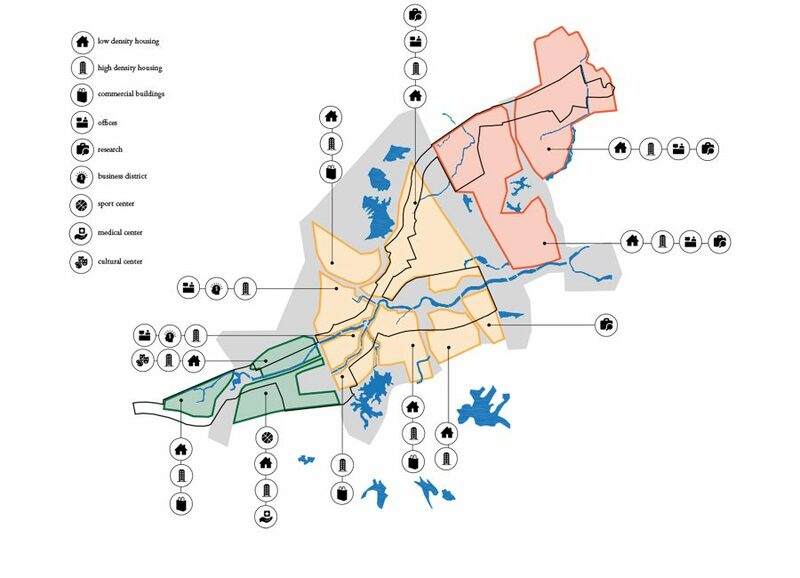 Pingshan Road will cross 3 main cities, signed by important natural and infrastructural bands: a culture/health oriented city, a new CBD business and multifunctional district and a research and technology city to the north. Simultaneously, these districts will be crossed by the high speed train to Huizhou-Xiamen, served by the new Pingshan station, as well as the subway system and several important ecological corridors. 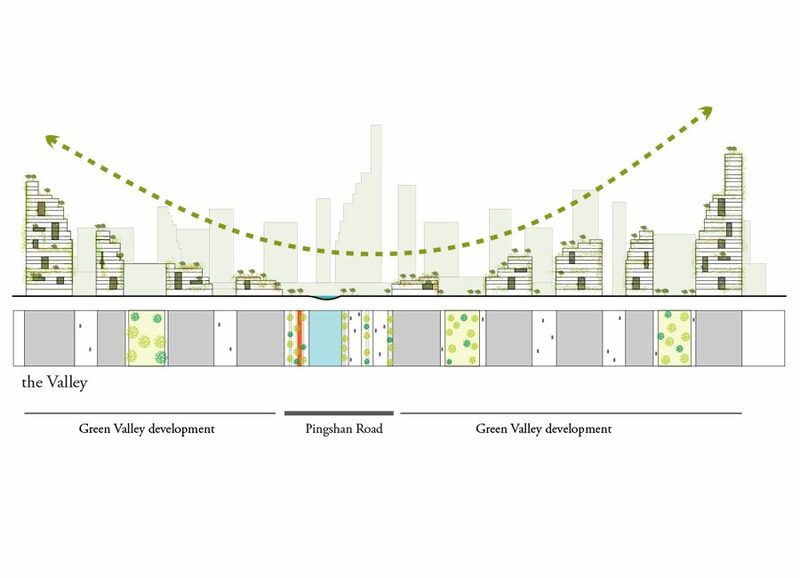 The different conditions that Pingshan Road will have to relate with, as well as the current infrastructure model of main express roads crossing Shenzhen, make us reflect on how to update the infrastructure model into a sustainable new direction. Starting from the analysis of the current infrastructure model of the city, as well as the last decades developments in China, we notice that the traditional motorway model is mostly car based. 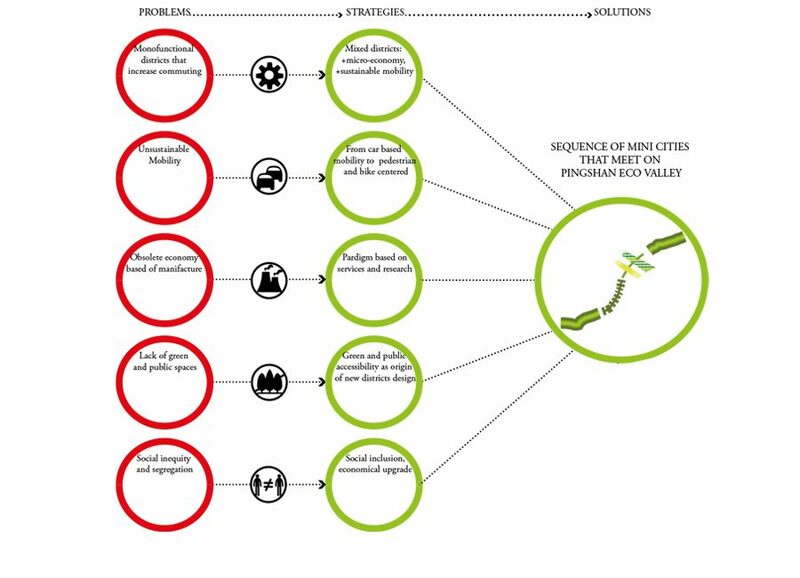 The need to connect districts very far from each other, as well as the growing use of the car as main mobility tool, has favored a fast development, too much car focused, ignorant of the role of the pedestrians. 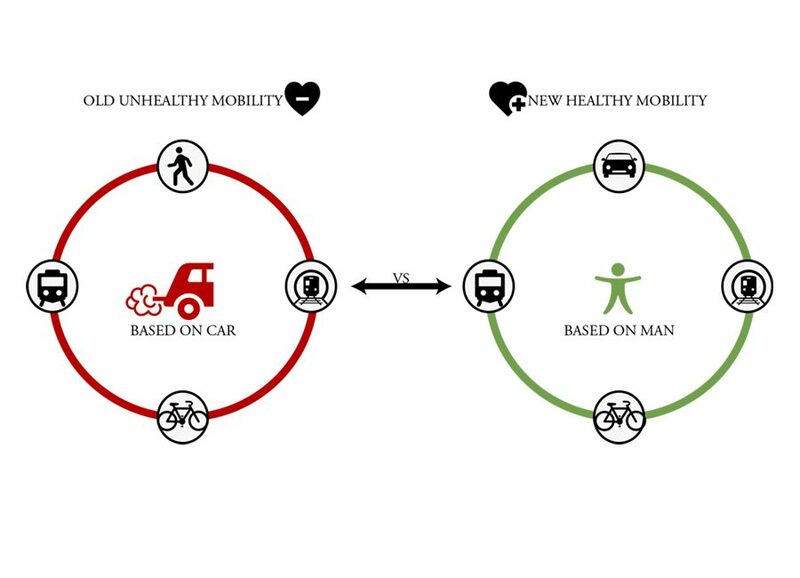 This model needs to change and, even though cars will stay by now largely used by our society, we need to think of new resilient models that will, on the long run, replace the car with modern low carbon mobility modes. 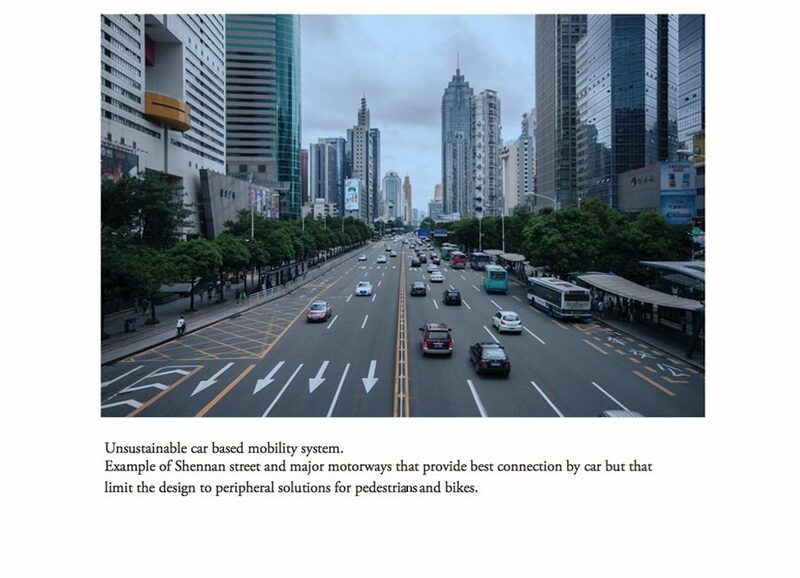 For this reason, the design of a new axis as Pingshan Road, needs to start from renovated premises and a flexible design that will allow a switch in time from fuel based mobility to new natural energy mobility systems. 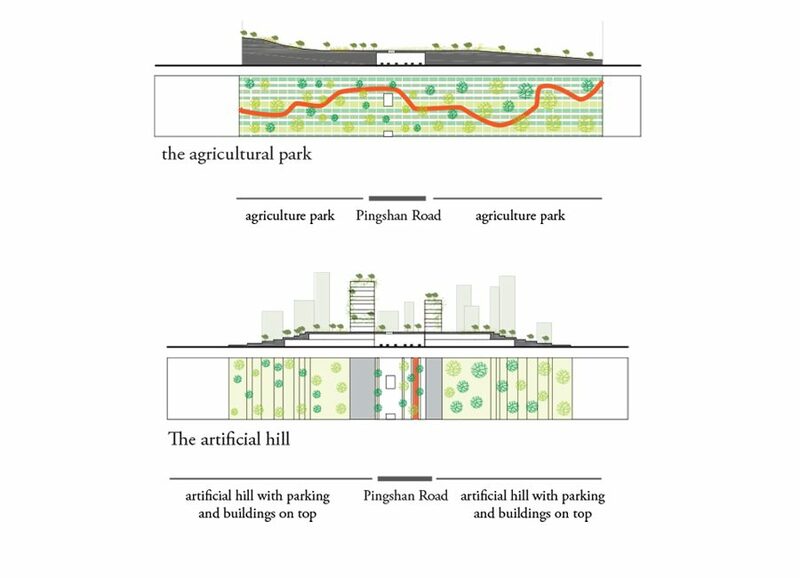 The design concept is based on the different adaptation to the three different contexts of Pingshan Road, reinterpreting the relationship between man and infrastructure, always based on people and nature, never on the car. The first typology of intervention will repeat equally in the two gates south and north to the area. 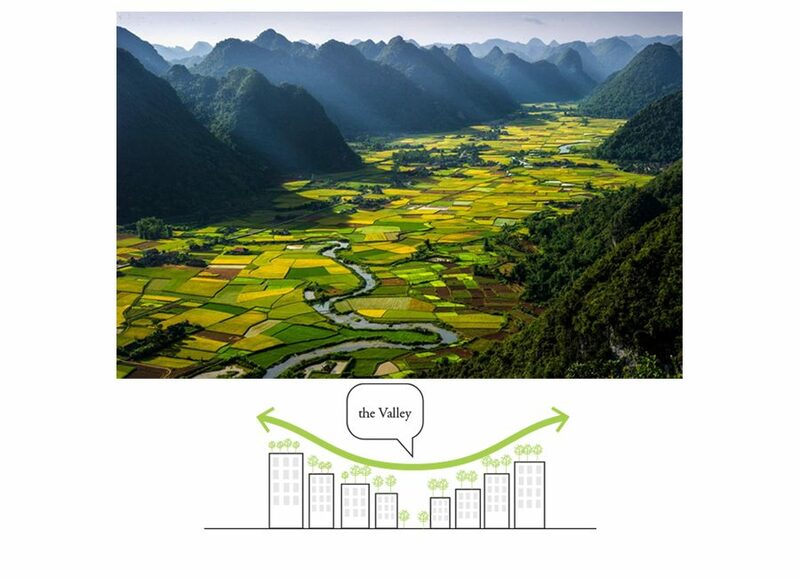 Approaching from Shenzhen or from east Huizhou, Pingshan will welcome visitors through a landscaped valley. 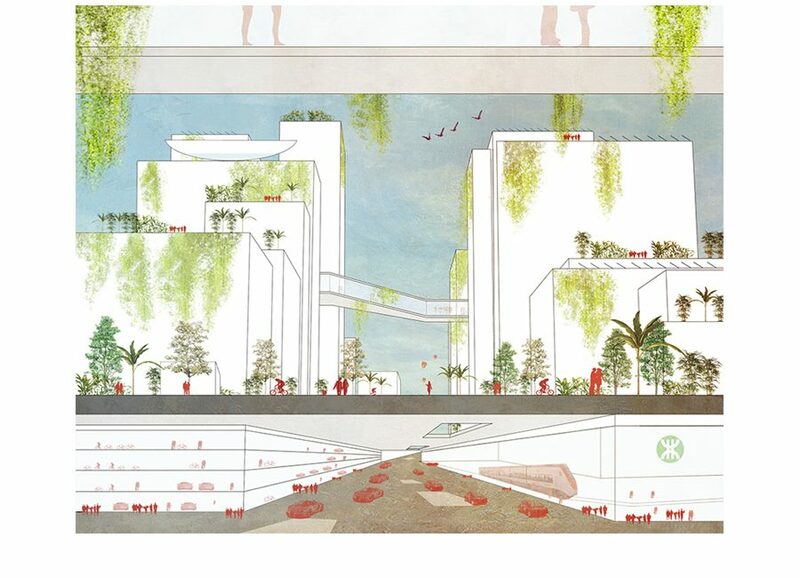 The traditional model of Shennan road, with high-rise concentrated on the street and low rise internal communities, has always compressed the space on the motorway. Instead this model concentrates the commercial activities on the road but it reduces as well its landscape perception and the possibility to dissipate car pollution. The result generates every time into wide road sections, where just a limited space is left on the sides for the pedestrians, forced to cross through underway passages or very long flyovers. This model is outdated. Roads need to be based first on the human scale of pedestrians and bikes, while reserving to cars and vehicles a temporary space, which will gradually be absorbed by new low carbon modes of transport. 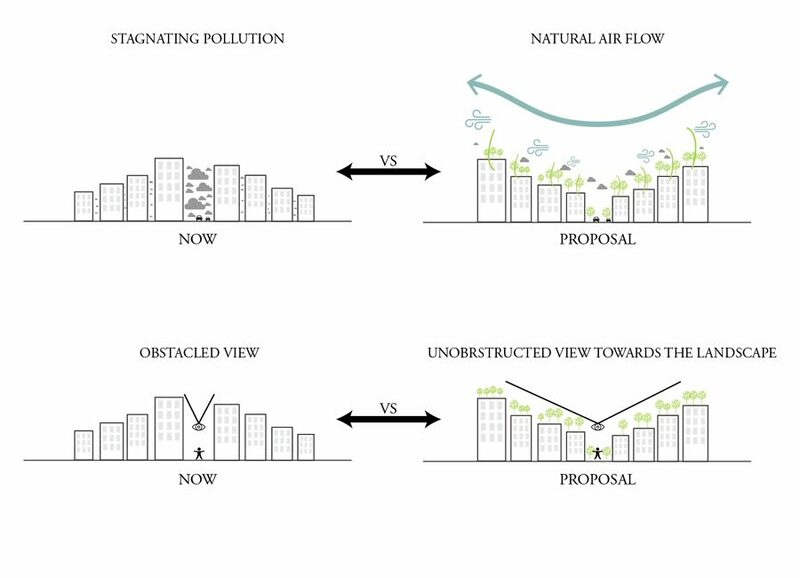 We introduce a new terraced scheme where the gradual growth of building height from the street towards the outside will increase the landscape and sky perception from the street, will improve the air quality, as well as improving the general landscape perception of the urban space. 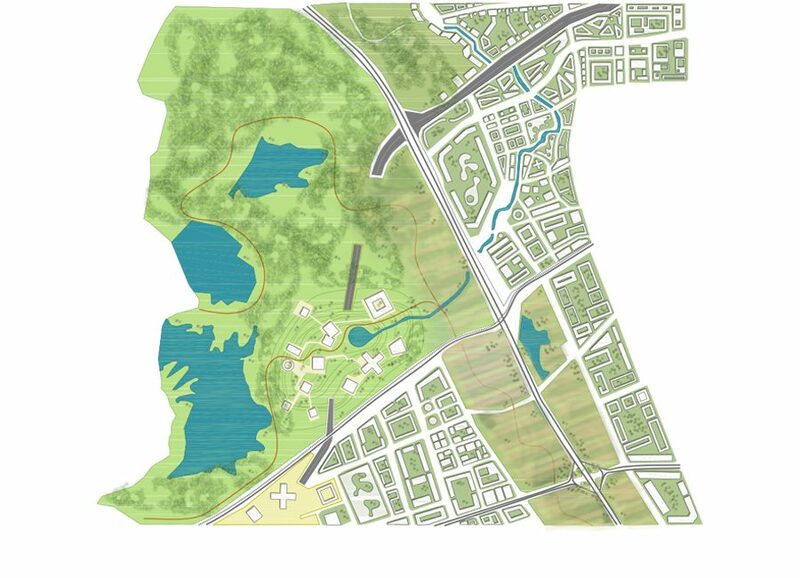 This model wills to transform a traditional motorway into a more extended section that hosts a real park; a green boulevard within which the car traffic occupies a limited side role when compared to the section. 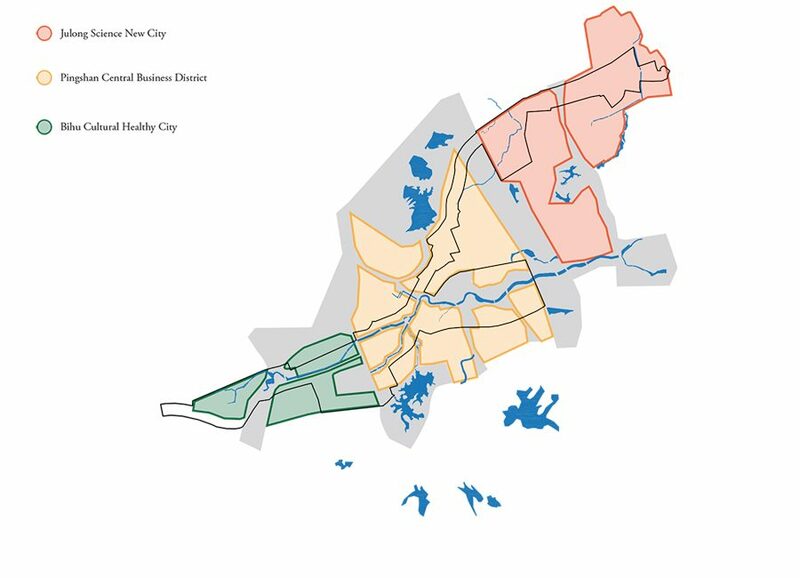 When crossing the new central business district, commercial values, as well as denser percentage of daily visitors and a congestion of mobility modes within a hub will need to face a necessary density, more typical of the CBD metropolitan context. 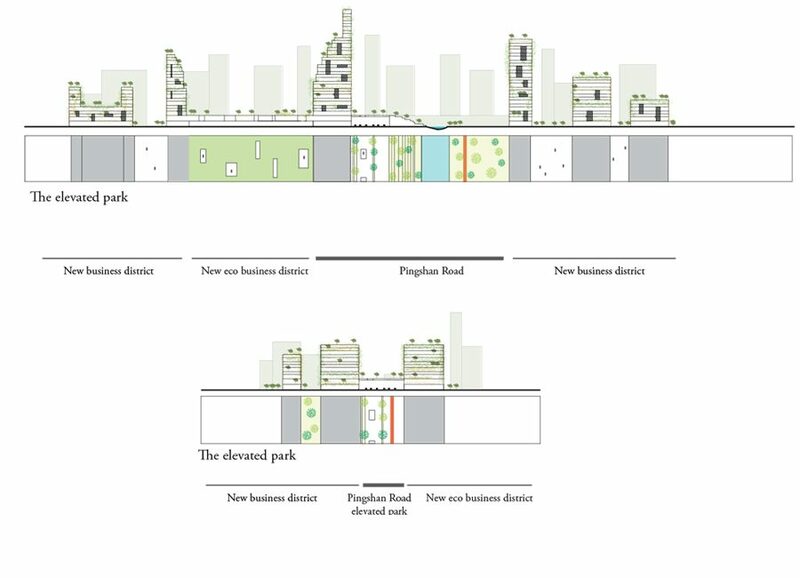 This implies taller buildings and denser development. 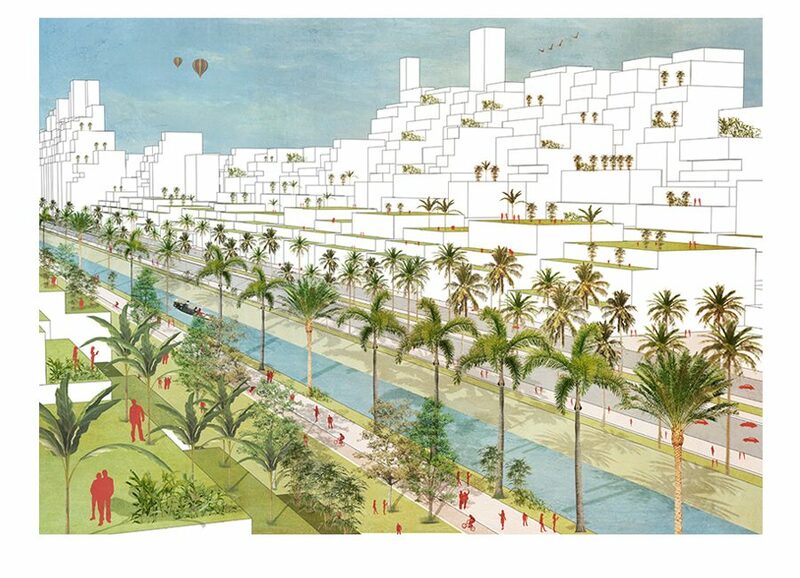 In order to face and blend this reality, we propose to cover the car section of the road with an elevated park that will clearly separate the fast and efficient car based environment from the upper development. 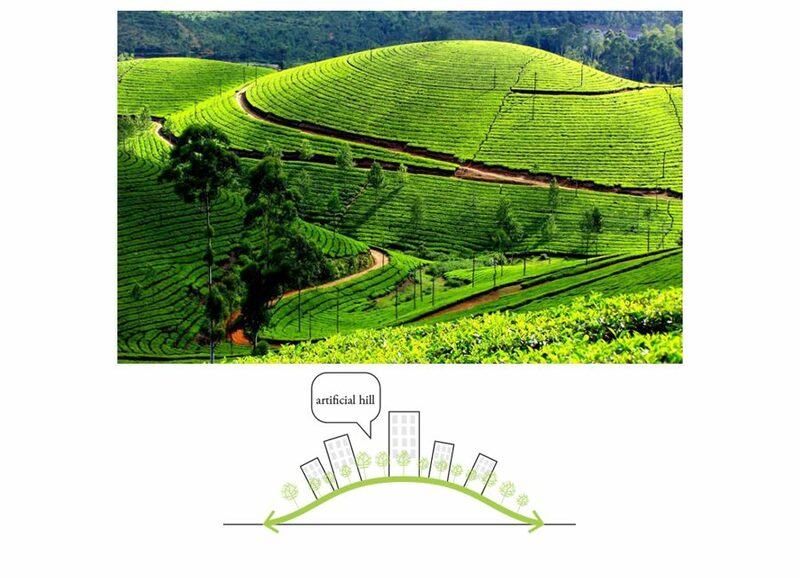 Sky gardens, bike and pedestrian roads and squares will articulate a vertical system where the impact of the car will be inexistent. 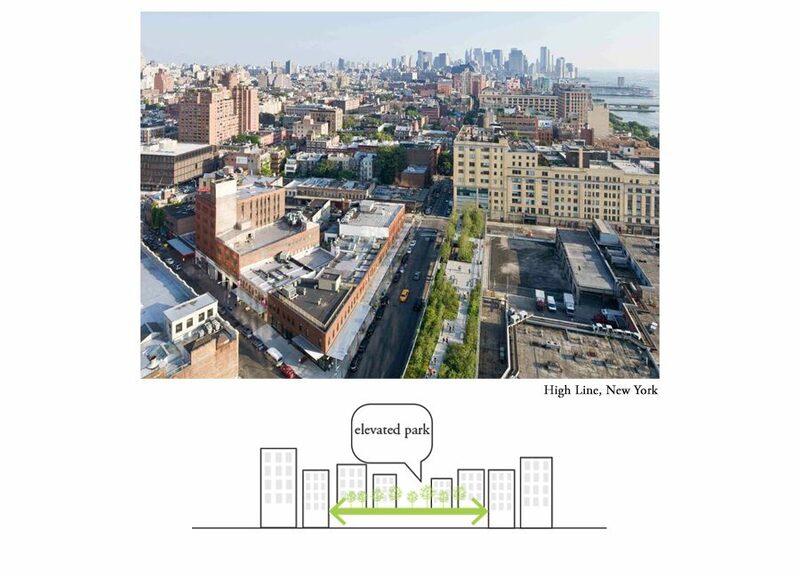 The lower levels will host a multimodal hub, exchange between car, subway, bike parking, collective shared car parks, as well as commercial areas. 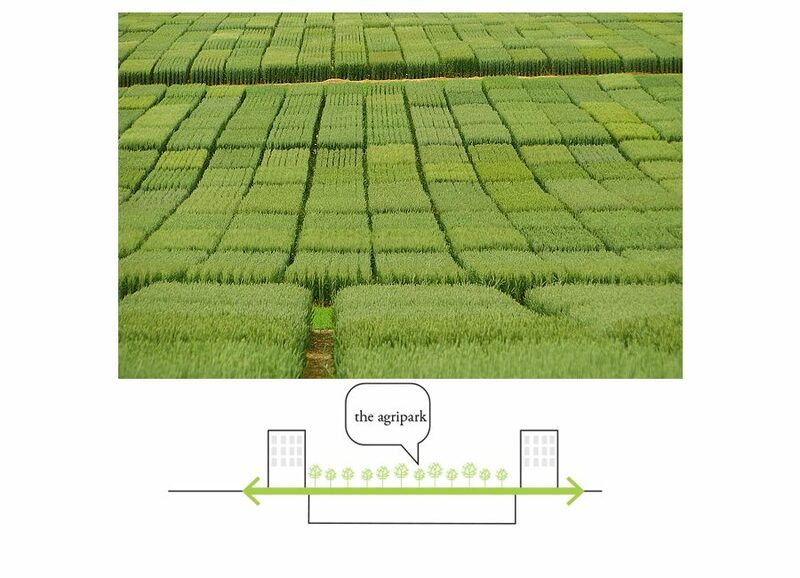 Towards north, when coming out of the business city, Pingshan road will cross a new research and technology city, where an important agriculture corridor will filter this new district from the CBD. 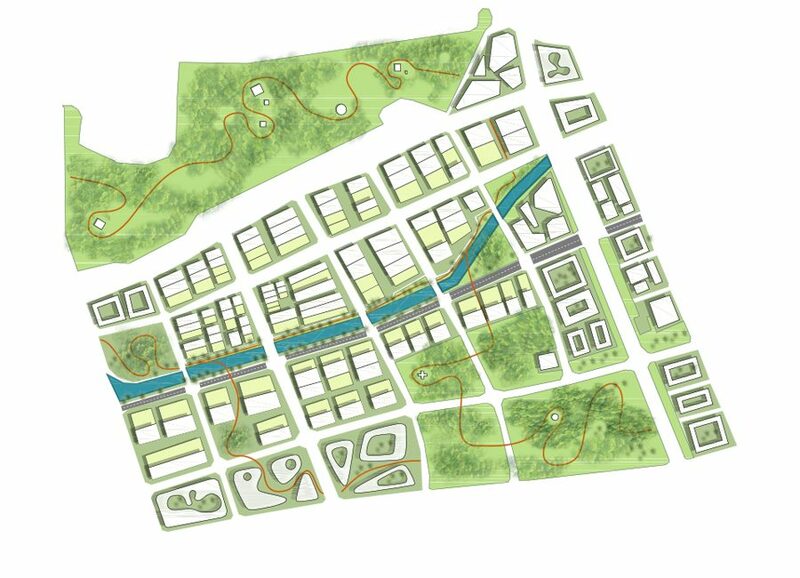 Our strategy proposes to develop a campus based system for the new research center, where the road section devoted to cars will be covered by an artificial hill. 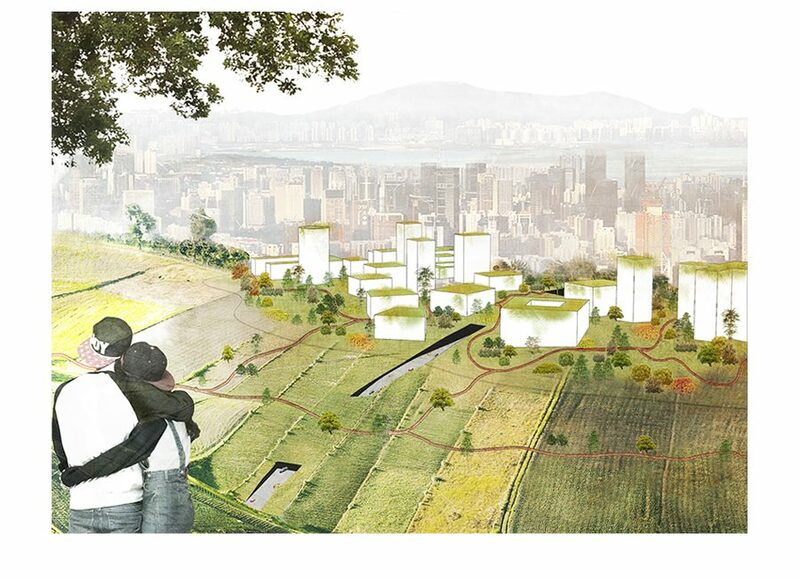 The hill will only resemble a natural element, while lodging underground the shared parking spaces; a renovated direct relationship with nature will favor a new healthy lifestyle for the inhabitants of the district, who will not experience the car, while living in a completely natural context, facing the agriculture corridor from north to south. The Road, after crossing the artificial hill, will we sunken underground for a short trunk, less than one km long, passing under the agricultural park. In order to avoid a double obstacle in the natural development of this ecological corridor, we try to preserve the circulation from north to south without blocking it with infrastructural boundaries. For this reason we propose to bury the Pingshan Road, which will re-emerge to the urban level right after crossing the agriculture park. This park constitutes a highly important corridor to preserve the natural network of nature and water elements crossing the east metropolitan area of the city.